Don Henley and Glenn Frey of The Eagles discuss a new documentary about the band, writer Diana Athill is the latest contributor to the Cultural Exchange project, and pubs on stage. 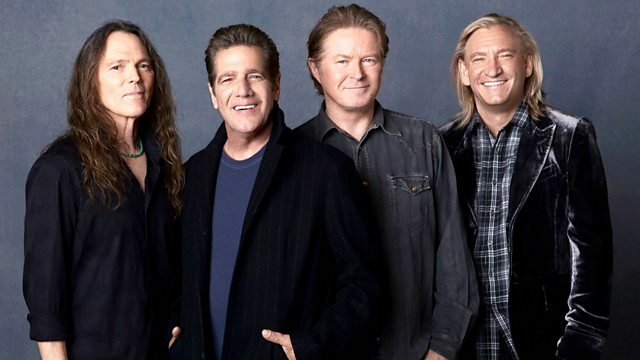 Glenn Frey, Don Henley, Joe Walsh and Timothy B Schmit of America's biggest-selling band The Eagles discuss a new documentary, History of the Eagles, which charts the ups and downs of their career and the stories behind their classic songs. More from the Cultural Exchange project, in which 75 leading creative minds share their passion for a book, film, poem, piece of music or other work of art: tonight writer and editor Diana Athill explains why Byron's letters have had such a lasting effect on her. The Weir by Conor McPherson, set in a remote Irish pub, and the musical version of Once, which has been transposed to a bustling Dublin pub, are both currently running in London. Josie Rourke, who is directing The Weir, and Declan Bennett, who stars in Once, reflect on the process of creating an authentic pub atmosphere on stage, and P J Mathews considers the theatrical history of the Irish pub.